Faro Island isn’t officially an island but is actually joined to the mainland by a narrow road that leads to a small number of parking areas. This is the beginning of the stretch of ‘barrier islands’ separated from the main land by the Ria Formosa. The island has cafés, restaurants and some hotels/B&Bs. There is also a very popular trendy bar with music and wonderful views over the beach and sea. This island, like the other five, is very popular with locals and Portuguese holidaymakers down from Lisbon and the north. 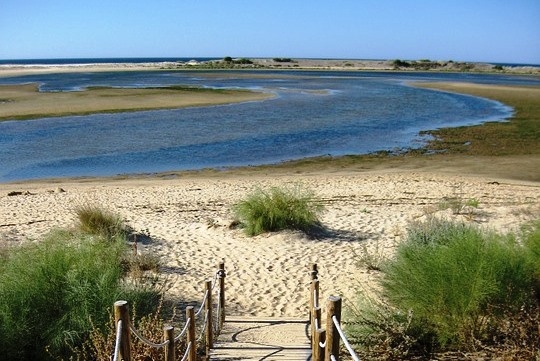 Faro Island is incredibly long and, if you have the energy to walk to the far end in the heat of August, you will pass by many kite surfers, jet skiers, and patrons of the school of water sports, to get to a vast area of gloriously deserted beach. A bus runs regularly from Faro bus station to this island all year round.